Is your outdoor living space everything it can be? Or could you raise your game a notch with a bigger, more comfortable deck and patio, all the better for entertaining friends and family outdoors? View from Dublin, OH, recent covered porch addition. That’s exactly what these homeowners did at their elegant home in the Ballantrae neighborhood of Dublin, OH. They had a small deck and patio, and while the two areas were connected by stairs, the deck and patio felt more like two separate small spaces. They consulted Archadeck of Columbus to talk about expanding their outdoor living space to make full use of the property spanning the entire back of the house. The Before and After photos tell the story, as does this video from our YouTube channel showing what a sweeping transformation it was. Archadeck worked with the homeowners to design a beautiful outdoor living environment that met their need for a much larger space in which to relax and entertain comfortably. The larger deck and patio more than doubled their outdoor living space, and they added amenities such as a covered porch, a fire pit and a seating wall around the new patio. To accomplish this stunning transformation, the Archadeck team of deck builders started with a blank slate by removing the existing deck and patio completely. 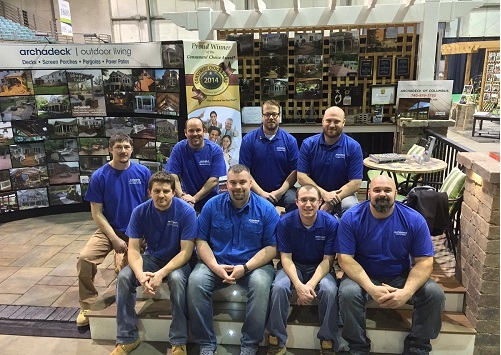 For the new deck construction, the homeowners selected TimberTech composite decking for its beauty, durability and low-maintenance features. 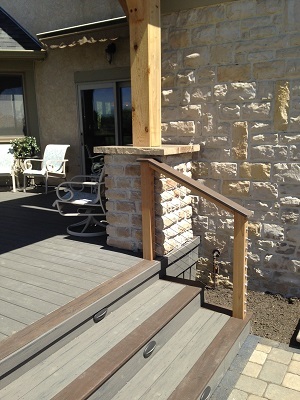 The main floor of the deck was built with TimberTech Terrain in Silver Maple, and for contrast the parting board, picture framing and stair accents were completed using TimberTech Terrain in Brown Oak. 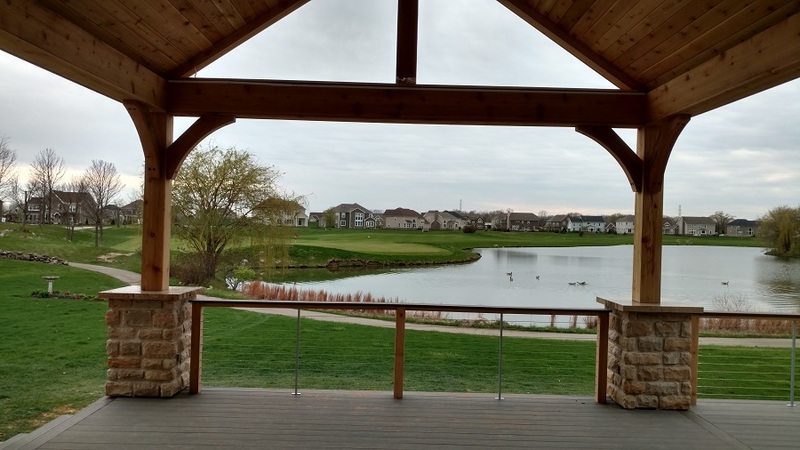 Surrounding the new deck is a cedar railing with Stainless Steel Cable, which practically disappears as you look “through” it – a nice touch, given the view from this deck overlooking the neighborhood pond. Capping the rail along the length of the deck is the same TimberTech Terrain in Brown Oak that was used for the parting board, picture framing and stair accents. Again, it contrasts richly with the cedar railing itself. The new deck was completed with TimberTech skirting around the deck and covered porch. Did we mention the porch? 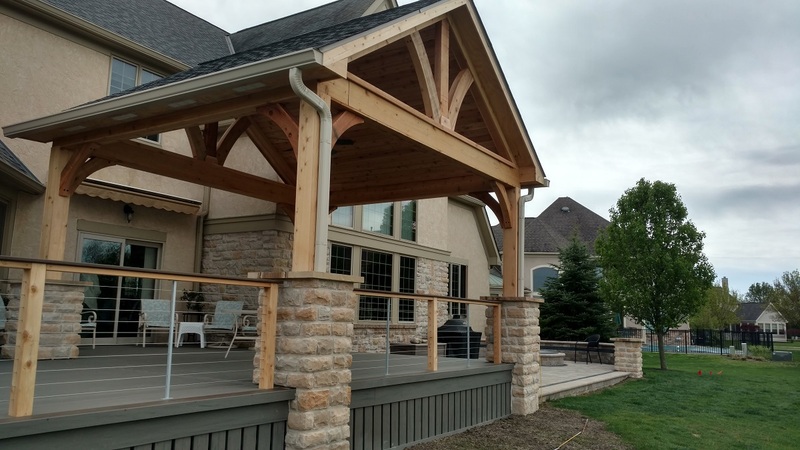 By adding a roof over a portion of the deck, we created a whole new focal point, a dramatic open porch with a ceiling fan to stir up a pleasant breeze on summer evenings. The porch roof features a gable end with a steep slope. It also features an attractive enclosed rafter interior ceiling with cedar tongue and groove boards. Pillars supporting the porch are cedar framed with stone and include a pillar cap from beautiful Brentwood stone from Semco Outdoor. Seen up close, the veining of the stone caps looks like wood grain – just stunning. A deck and porch combination as beautiful as this deserves a patio to match. Archadeck of Columbus designed and built a grand patio that is especially inviting at night when everyone wants to gather around the new stone fire pit. The patio was built with pavers from the Unilock Camelot series, like cobblestone with a modern twist. The homeowners selected the Riverbend color for the patio with a stone border of Unilock Series 300 in Charcoal. A retaining wall provides plenty of seating for all who want to enjoy the magic of the fire pit. 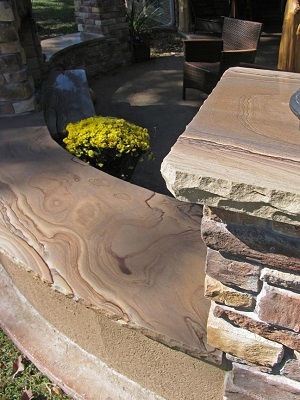 The seating wall was built with Unilock Brussels Dimensional Stone in the River color, and the coping atop the wall is Brussels Fullnose in Sandstone. The coping provides a rounded edge that makes the wall comfortable to sit upon. No rough edges here! Guests will enjoy the gas-burning fire pit, which features crushed glass inside to emit a hypnotizing glow. The fire pit was built with the same Unilock Brussels Dimensional Stone as the retaining wall, visually tying the components of the patio together. Finally, the Archadeck team installed gutters for the porch cover and added TimberTech deck lighting for the steps. Low-voltage lighting illuminates the patio’s seating wall. This subtle but effective lighting increases the safety of the outdoor living space at night while creating a pleasing ambiance for family and friends to enjoy. 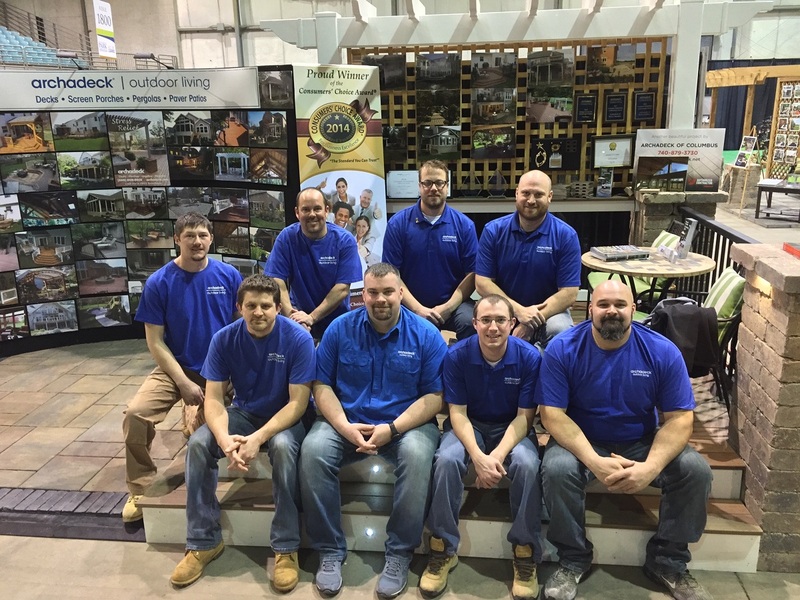 If you are ready to kick it up a level and make your outdoor living space everything it can be, Archadeck of Columbus can design the deck, patio and porch you’ve dreamed about. Contact us today to learn more at (740) 879 – 3730 or email us at [email protected].